Captain Nathan Algren, a disenchanted ex-US Army Captain, is tortured by the guilt of his past transgressions against Native American civilians. He is recruited by his former commanding officer Colonel Bagley on behalf of a Japanese businessman, Mr. Omura, to help the new Meiji Restoration Government train its first Western Style Army. Algren, under the command of Bagley, trains an army of peasants and farmers in firearm techniques, and is forced to take them into battle, despite lack of sufficient training, against a group of samurai rebels led by Katsumoto, to defend Omura's investment in a new railway. During the battle, the samurai slaughter Algren's poorly trained and inexperienced soldiers, Bagley withdraws from the field, and Algren is captured. Algren, after killing some samurai himself with pistol, a saber and a broken spear, is taken as a prisoner to an isolated village, where he gradually recovers from his wounds. He lives with the family of the samurai he killed, namely his widow Taka, her two sons and Katsumoto's son Nobutada. Over time, Algren's mental and emotional state improve as he learns "the way of the samurai", develops romantic feelings for Taka, studies swordsmanship from a skilled swordmaster (Ujio) and converses with the local residents, gaining their respect. One night, as the people watch a comic play, a group of ninja assassins attack the village, intent on killing Katsumoto. The Samurai succeed in defeating the ninja, but suffer losses. Algren wins the respect and admiration of the samurai by fighting alongside them, and distinguishing himself in the battle by his defense of Katsumoto. Katsumoto confides in Algren that he believes that Omura is responsible for the attack. With the arrival of spring, Nathan is taken back to Tokyo, where he learns that the army, under Bagley's command, is now better organized and outfitted with howitzers and Gatling guns. He declines Omura's job offer to lead the army against Katsumoto, to crush the Samurai rebellion. He also witnesses the brutality of the Japanese soldiers who enforce the new laws forbidding samurai to publicly carry swords and wear their hair in chonmage. At the same time, Katsumoto offers his counsel to the Emperor to whom he was once a teacher. He learns that the young Emperor's hold upon the throne is much weaker than he thought, and that he is afraid to challenge men like Omura, who control vast wealth and political power. The samurai leader Katsumoto is arrested and confined to his quarters in Tokyo when he refuses to remove his sword in the Emperor's presence, but Algren, having learned that Omura has ordered his assassination, and narrowly escaping an assassination attempt on his own life (through judicious use of martial arts he learned in Katsumoto's camp), decides to rescue him with help from several of Katsumoto's loyal followers. During the rescue mission, Katsumoto's son Nobutada is killed while allowing Algren, Katsumoto and the rest of the team to escape.Katsumoto is still mourning the loss of his son when he receives word that a large Imperial army unit is marching out to battle the samurai. A force of warriors, numbering only 500, are rallied. Algren receives a katana of his own. He is also given, by Taka, the armor of the samurai he killed. She dresses him into the armor, and they share a kiss just before Algren leaves. The samurai plan, with the assistance of Algren, is to make their final stand, using a combination of superior close-combat ability and their enemy's over-confidence. When a large Imperial Army, under the command of Omura and Bagley confronts the samurai's forces to put down the rebellion, the samurai fall back to higher ground. Omura immediately orders the infantry to pursue them, as expected. The samurai lead them into a trap, setting a fire to cut off their escape routes. The samurai then unleash volleys of arrows on the infantrymen, killing many. Drawing their swords, the samurai, Algren and Katsumoto amongst them, charge the confused and wounded infantrymen. A second wave of Imperial infantry follows behind and quickly joins the battle, as does the Samurai Cavalry. After a savage melee that leaves many samurai and infantrymen dead, the surviving samurai resolve to make a final charge. They charge on horseback, being cut down by Japanese cannons and then by another unit of infantrymen. During the battle, Bagley shoots Katsumoto but does not kill him, and Algren then throws his sword into Bagley, killing him and saving Katsumato's life. Against all odds, they manage to make it through the enemy lines. On approaching the imperial rear line, and progressing enough to scare Omura, the Samurai are suddenly cut down by the gatling guns the soldiers had acquired from the Americans. Katsumoto and Algren are badly wounded from the encounter, and are seemingly the only survivors. The Imperial general, against Omura's wishes, orders the Gatling guns to cease fire, feeling the emotional pressure from the dying samurai. Katsumoto, obeying bushido in order to keep his honour, commits seppuko (ceremonial samurai suicide) with help from Algren, ending his life. The Imperial troops, many of whose comrades have also been killed, show their respect by bowing to the fallen samurai. Algren, who survives the battle heavily wounded, stays at Katsumoto's side. 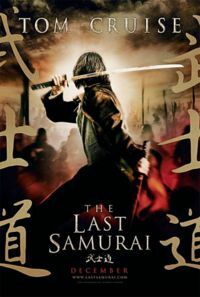 Later, as American ambassadors prepare to have the emperor sign a treaty that would give the US exclusive rights to sell firearms to the Japanese government, the injured Algren offers Katsumoto's sword as a present to the Emperor and urges the emperor to turn away the American ambassadors' offer. The Emperor agrees and tells the American ambassador that the deal is not in the best interest of Japan. Omura objects, and the emperor - realizing he does not need to live in fear of Omura - confiscates his estates and fortunes. Omura is greatly distressed at this, so the emperor offers him Katsumoto's sword to commit seppuku if the dishonor is too great to bear; Omura however, lowers his head and stumbles out. Algren then returns to the samurai village where he was imprisoned earlier, and to Taka.